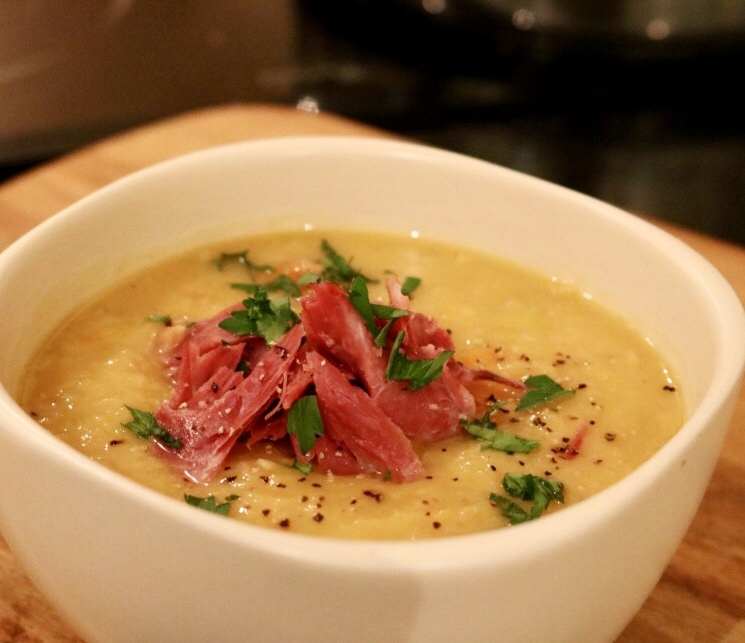 The perfect soup for a chilly day, make the day before as it tastes even better the next day! 1. Place the ham shank, bay leaves and water into a large pan. Bring to the boil and allow to simmer for 2 hours and the meat is falling off the bone. Remove the ham from the stock and allow to cool. 2. In a large frying pan melt the butter over a medium heat and gently fry the leeks, onions, carrots, swede, potatoes and garlic for 15 minutes until softened, not browned. Sprinkle over the curry powder and stir through for a further minute. 3. Place the vegetables in the pan of stock, add the lentils, bring to the boil and allow to simmer for 40 minutes or until the lentils are cooked. 4. Remove the bay leaves and blend half of the soup and place it back with the remaining soup (I believe leaving some texture is best). 5. Break or shred the ham into the soup and season to taste with the tabasco, salt & pepper. Enjoy!